A vibrant new restaurant serving the best of North Vietnamese cuisine. A vibrant new restaurant serving the best of North Vietnamese cuisine has just opened on Dixon Street. The head chef, Tony Dong, previously ran the show at Chow and then Dragonfly before opening his own place. 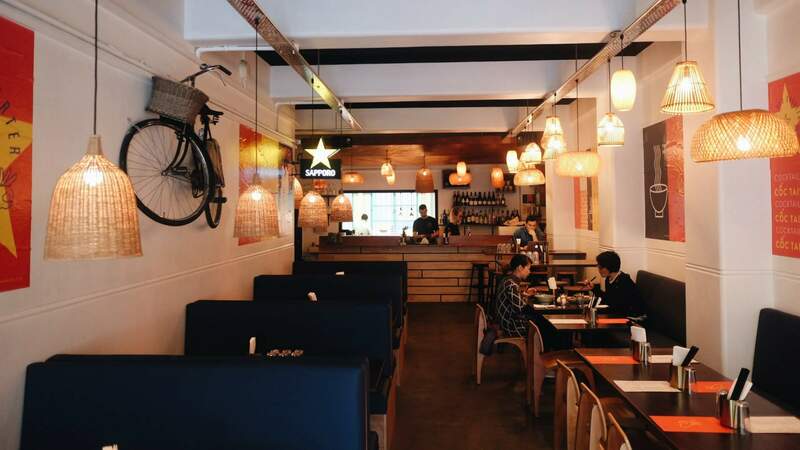 Chef Dong has created the menu from scratch to bring Wellington specialties from the Hanoi region that have their own character. If you are wanting to try a variety of flavours on one plate, then ordering the Bun Cha Hanoi is a must. The Hanoi specialty serves lemongrass grilled pork, spring rolls, pork patties, fresh herbs, pickles and a very spicy dipping sauce. This dish gives you samplings of Hanoi's best street food. While there is a lot of food, it is in miniature form which adds to the cuteness. If you have ever been to Vietnam, you'll know they have a passion for condensed milk coffee. The Old Quarter has you covered with the Vietnamese espresso martini — because why not add alcohol to the mix? The restaurant also has a surprisingly substantial and fruity cocktail menu. The Skinny Colada was delicious and possibly consumed too quickly. The sprinkled cinnamon on top was a welcome addition. The five spice roast pork bao was by far the best bao I have tried in Wellington. What made this bao experience a stand out from the rest is the thinness of the steamed bun. The slimmer bao ensured the fillings of crispy pork, pickle, coriander and hoisin flavours inside had all the glory and the spotlight they deserved. When it comes to the bao, a small variance can make a dramatic difference and this one certainly paid off. The salads on offer will make you feel happy and satisfied. The mango salad was a pleasure to eat as the fragrant chicken was infused with incredible spices and flavours. With cashews, mung beans, coriander, fried shallots, this salad is hearty. For the more adventurous, try the orange salad which comes with roasted duck and cherry tomatoes. The Old Quarter is undeniably quirky. From its eccentric menu to the sassy decor; the place has its own vivacious charm. Because of the reasonable prices and the quality of food served at The Old Quarter being so high, this up and coming establishment is in contention for the best Vietnamese that Wellington has to offer. This is a big call but the food was seriously that delicious.